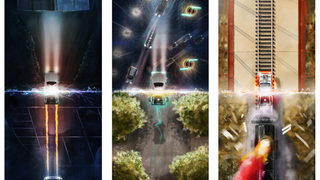 Andy Fairhurst's excellent 'Nerd's Eye View' series has given us some gorgeous new perspectives on pop culture icons - but this new series of prints based on the Back To The Future might be some of Fairhurst's finest so far. And good news - each print is available for sale as of today on Bottleneck Art Gallery, costing $35 each or available as a bundle for $95. As of writing, they're not sold out, but be warned: these beauties will probably vanish quicker than a time-travelling sports car.